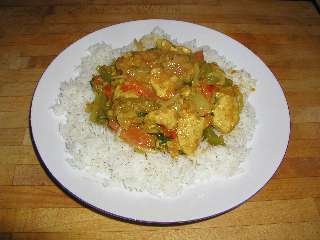 Chicken lends itself to curry recipes as it is low cost, plentiful, cooks quickly, is nutritious and liked by most people. Many curries, particularly those from take-away shops, seem to have far to much oil or have a heavy sauce. This free recipe is for a curry with a lighter than usual sauce and includes vegetables so reducing the necessity for side dishes and keeping the calorie count as low as possible without sacrificing flavour. It can be made as hot or mild as you like by adjusting the chilli and cayenne. Serve with plain boiled rice (allow 320g for 4 servings) and if needed a side dish of carrot and cabbage curry or a spinach dish. 400 - 500g (approximately 1 lb) chicken breast meat off the bone and skinless. If using thighs that are on the bone use 600g and cook slightly longer. 1 large onion, about 200g (0.5lb) medium sliced into half rounds. 1 medium size (2" or 5cm long) hot green chilli. More may be used if you prefer a hotter curry. De-seed the chilli if you want the flavour of chilli without so much heat. Peel the tomatoes by putting them into a bowl and pouring over boiling water, leave for 5 - 10 minutes and the skin should start to separate from the flesh. Remove from the bowl and peel properly. Make a paste by mixing the water with the ground spices in a small dish. Heat the oil over a medium high heat and add the onion when hot, stir and fry for 3 minutes or until the onion just starts to brown. Add the chopped ginger, crushed garlic and chopped green chilli. Stir and fry for a further minute. Add the chicken and continue to stir and fry until the meat has lost all its pink colour and has begun to brown. Reduce the heat to medium and add the ground spice paste, continue stirring and frying for 3 minutes ensuring that all the chicken is well coated in spice mix. Cover and cook on a medium low heat for 5 minutes making sure that the mixture does not stick or burn. Uncover and add the sliced peppers, continue stirring and frying until the mixture comes back to the boil. Stir in the sliced tomatoes and salt, continue heating whilst stirring occasionally until the mixture is back to a gentle boil. Cover and cook for 20 minutes on a low to medium heat until the chicken is tender, check frequently. If the mixture shows signs of sticking, add a little water and bring back to a simmer. Add the lemon juice and stir, continue cooking for 2 minutes. Add the fresh coriander, stir once and serve. Other vegetables can be added in place of some of the peppers, these include aubergines (add near the start of cooking), bean sprouts (add near the end). Always make sure that they are fresh. Try the basic recipe first.